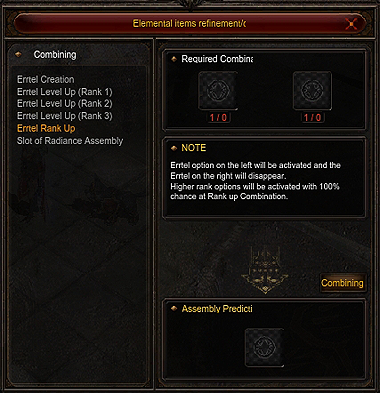 - Rank up Combination System has been changed to be simpler, and rank up rate is now 100%. - If you combine two 1Rank 7Level Errtels, you will get one 2Rank 0Level Errtel with 100% success rate. - If you combine two 2Rank 7Level Errtels, you will get one 3Rank 0Level Errtel with 100% success rate. ① Errtels of same type (Anger/Blessing/Integrity/Divinity/Radiance) and same element(Fire, Water, Earth, Wind, Darkness) must be used as combination materials. ② Two items in the same rank with level higher than 7 must be used as combine materials. ③ The Errtel at the left slot of the combination window will be ranked up and if succeeded, previous option will be kept. ④ The Errtel at the right slot of the combination window will be destroyed after combination. ① Rank up combination success rate is 100%. ① Left slot is the main material slot; it will be the base of the rank up and option will be given. ② Right slot is the sub material slot; it will be destroyed after rank up.